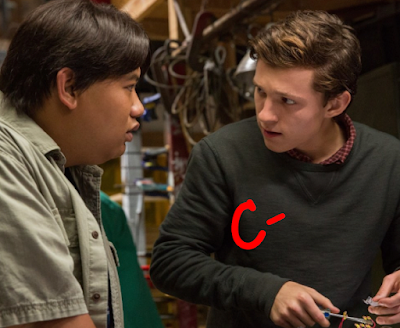 In Spiderman: Homecoming, director Jon Watts replaces Andrew Garfield and Tobey Maguire with Tom Holland. Jon’s last project was Cop Car (2015), which earned a nod of respect from some, but we aren't exactly in agreement as to how good a job he did with that one, much less what he would do with this one. Holland? 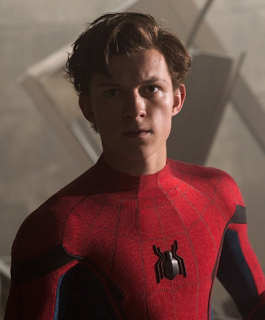 Well, he was for sure a good pick, better than both Garfield and Maguire. Holland uses his kid charm and dashing good looks and makes all the impressions we hoped for. His squeaky-clean voice and juvenile insecurities serve him well. That’s all fine and good, except the movie itself is not. Initially, we are excited at the backbone of the plot: Criminals are using leftover alien technology (from Avengers, 2012) to terrorize the world. Sounds good, but it goes nowhere beyond the safe-playing locker-room struggles of Parker who is being mentored by Tony Stark. That's what we keep getting from the movie more than anything else. Spider-man has already been making good on his crime-fighting abilities, but we don't see much of them. Young Parker comes across a crime syndicate (headed up by Michael Keaton - as Adriane Toomes / "Vulture" - the original Batman of the 1980s, who here flies around in a large, ridiculous bird costume). Yeah, yeah, I know. It fits the comics, but it doesn’t work here. It just doesn't. And Keaton doesn’t seem real. He's too one-dimensional. Marisa Tomei is "Aunt May" this time around. Most of the film’s time goes into the high school dramas of awkward first loves, trying to fit in at the parties of the cool kids, and the desire to find meaning in what he can contribute. All of that I can respect, believe me. But like the high school hook-ups, even the bad guys in this film go nowhere to audiences above 14 years old. They don’t grab our attention, nor do we want to learn more about them as Stark keeps checking in on Parker to keep tabs on him. A young, impressionable, and wet-behind-the-ears teen is a nice touch that displays vulnerability and makes for a more interesting character, but certainly not at the expense of a seamless and serious script. Stark assigns “Happy Hogan” (Jon Favreau) to do most of the leg-work in keeping track of Parker. And this Happy Hogan fellow is an insulting waste of screen time, like much of the film. In this sappy-but-adolescent-friendly world, bad kids in detention are lectured at in the form of videos by Captain America. These smirk-worthy appearances of the Captain are never followed up with any supporting contexts that allow the movie to be truly funny. In fact, it’s almost humorless, despite intentions. But we keep coming back to Holland, however, whose abilities and confidence take him beyond the writing he is given. Holland’s well-played juvenile insecurities are great. He does a damn fine job with them. 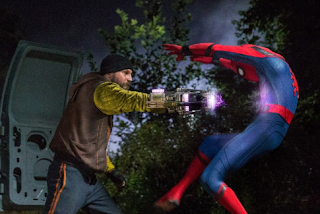 He is set up to re-appear as Spidey for at least several more films. More power to him, just not to this film. The fight sequences are woefully disappointing. And on top of that, Spidey seldom gets to strut his stuff for us like he did in Avengers: Civil War (2014). Those combat scenes that run longer don’t grab our attention anymore than the shorter ones do. The final battle is a letdown and anticlimactically positioned. This is partly because we don't take the villain seriously, but partly because it is difficult to follow the way it is laid out. Ultimately, we needed more from Homecoming, and we didn't get it here.